How to Live a Purpose Driven Life – Decoding the Life. Friends, almost everyone knows that what is life? But they don’t even know that how to live a purpose driven life? and What is the purpose of our life? And today in this article about Decoding the life, I am not going to tell you anything that we’ve been hearing from a long time ago or anything like traditional. So, today I want to share my thoughts in front of you. Hope you guys feel Great after reading this article till the end. Hey guys, I am Rishabh a contributor of Geeabo and I welcome you at Geeabo.com and I recommend you to read our previous article How Can I Submit Website To Google Search Console. What is Life – Decoding the life. Life is that sort of term which can’t be explained or formulated either. It is as unpredictable as one can think of. At one moment it seems as a paradise while in other it turns out to be hell. What’s the reason behind this variation?? The reasons behind this variation are not the circumstances, it is just because the lack of purpose and meaning which is the main culprit and most of the peoples do not understand the thing. How to Live a Purpose Driven Life. Friends, we are having a misconception that we can only live a purpose driven life when we just try to find happiness and success everywhere as we think that this is what the definition of an idle life is. But we have to realize that success and happiness are not certain and permanent. In fact nothing in this universe is certain and permanent, change is the only permanence. And rather than finding happiness for us and our close ones only, we should try to find the true purpose and meaning of life. And for me the true purpose of life is not just inclusive in chasing your dreams and achieving goals. It is said that “Money can’t buy happiness”. But I would like to quote this as “Money can buy happiness but it can’t buy meaning of your life. I would like to say that Live your life purposefully and try to serve others as well without any expectations, as not every organism is luckier enough, as us who got a human life to live. And try to live with the pace at which the world is changing by keeping your self reminded about the purpose as well as the goal of your life. Enjoy the pleasure of this roller coaster life which is full of surprises. Don’t just ruin it by living on prejudices. 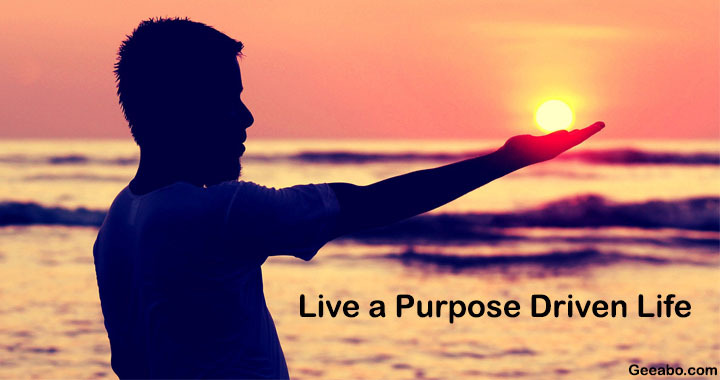 Hope you like this article “How to Live a Purpose Driven Life – Decoding the Life” and you have learn something new with the help of this article. Please Do Like, Comment and Share if you really like this. I am currently studying in BHU. I write on life philosophy, political issues, sports,etc.